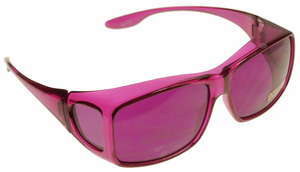 Colored sunglasses can be worn for style, to shield eyes from the damaging rays of the sun or both. 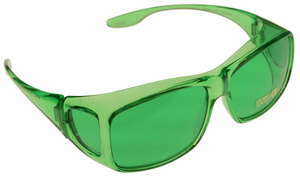 They can be prescription or not, too. 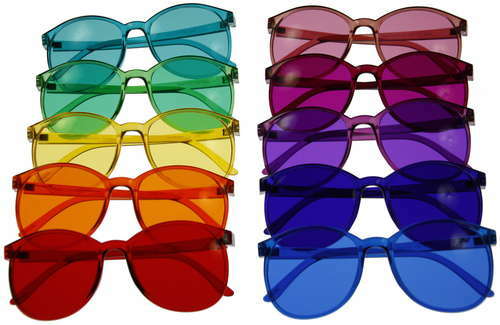 But what differentiates sunglasses from regular glasses is the tinting. 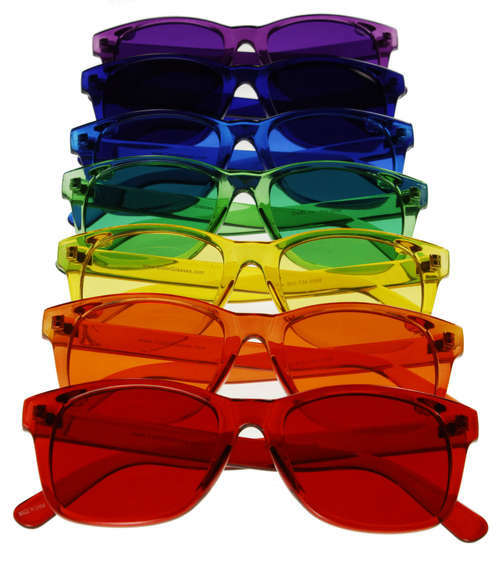 Whereas regular spectacles (i.e., glasses) are clear, sunglasses are made from many different colors. 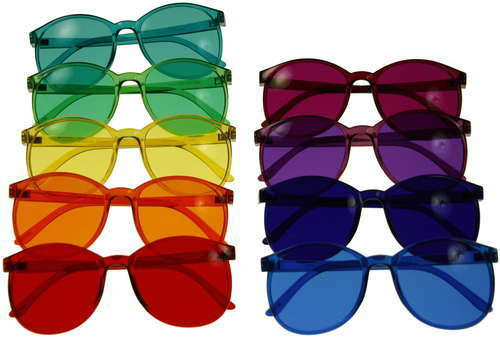 Plastic can be made in any color of the rainbow. 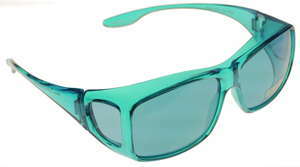 And, thanks to modern glass making techniques, it is now possible to make even prescription sunglass in any color you want. 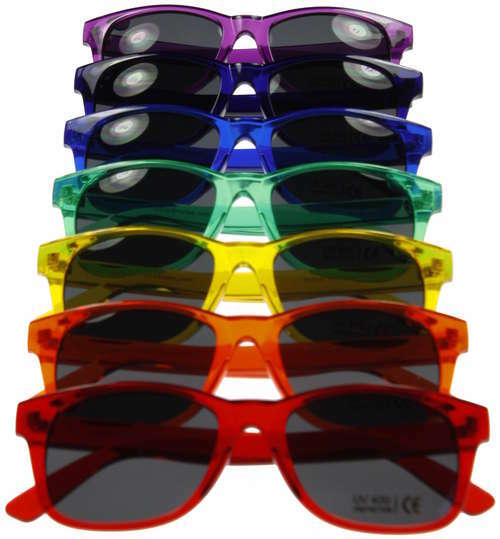 There are a lot of brands of sunglasses out there. 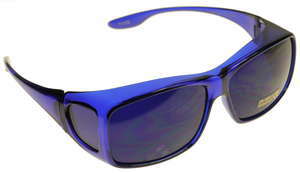 There are designer sunglasses or you can buy a pair of replica sunglasses from the local gas station. 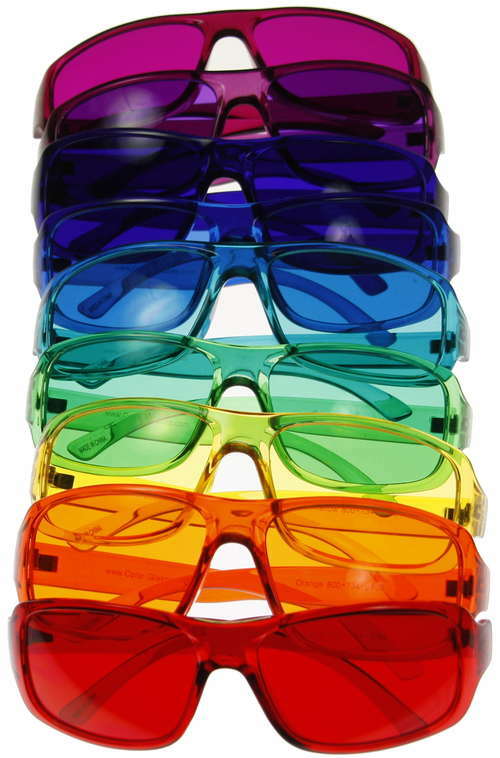 Whatever kind of glasses you decide to buy, make sure that they fit both your style and your face well, in addition to protecting your eyes from the sun. These are not cheap sunglasses, rather, they are inexpensive discount sunglasses. 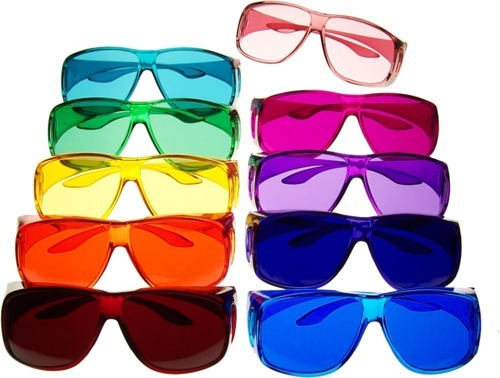 Why pay $29.95 for the same glasses at a department store? 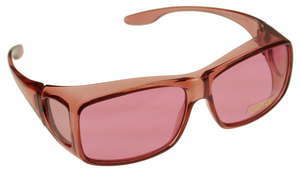 Order online and save. 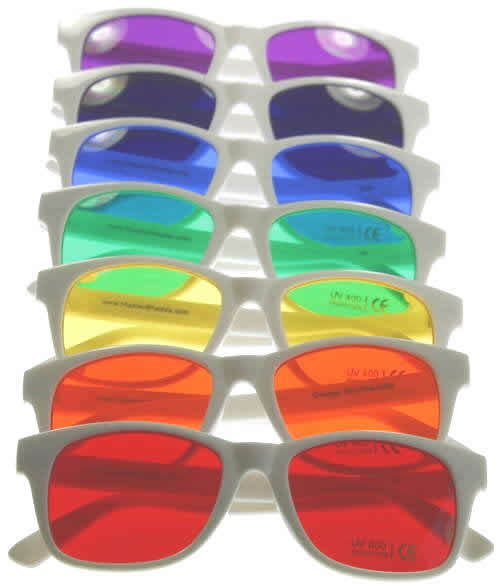 All our sunglasses are UV 400, 100% UVA and UVB protection. 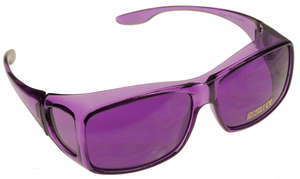 Read more about ultraviolet light. 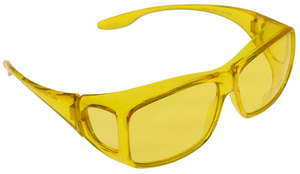 Except for yellow, please do not wear these glasses to drive. 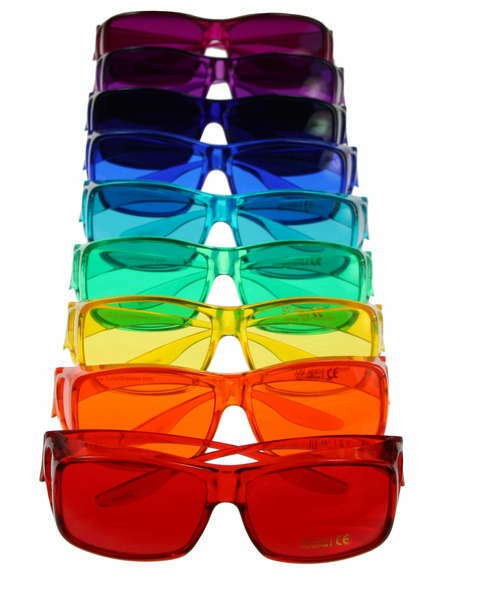 They may change the color of traffic lights and brake lights. 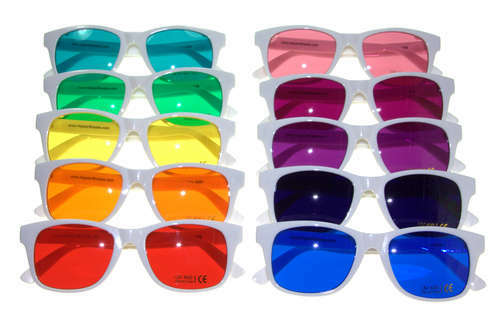 Why wear everyday sunglasses when you can buy colored sunglasses online. 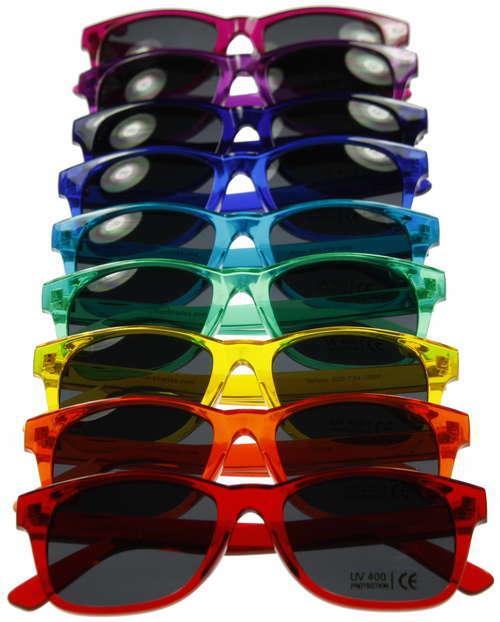 Spice up your life with these fun colored lense sunglasses. 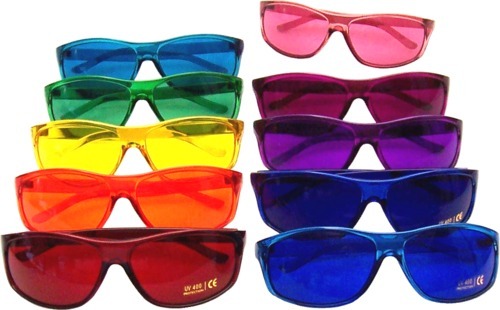 These rainbow colored plastic glasses are available in: Red, Orange, Yellow, Green, Aqua (Turquoise), Blue, Indigo, Violet (Purple), Magenta (Rose) and Baker-Miller Pink. 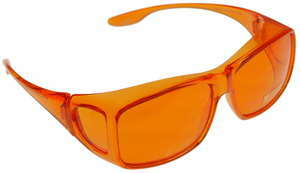 be sure they do not change the color of the traffic lights or brake lights. 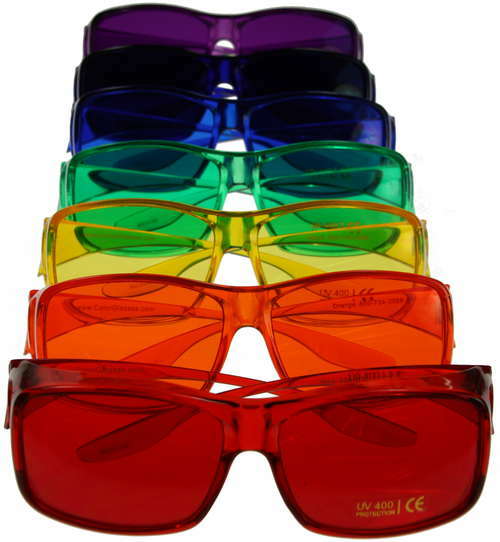 People's vision is different so we cannot say which ones are safe for driving. 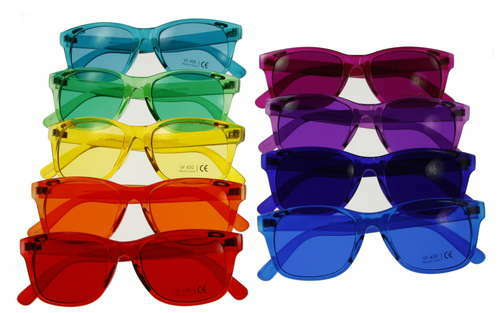 Also the darker colors may make objects hard to see. 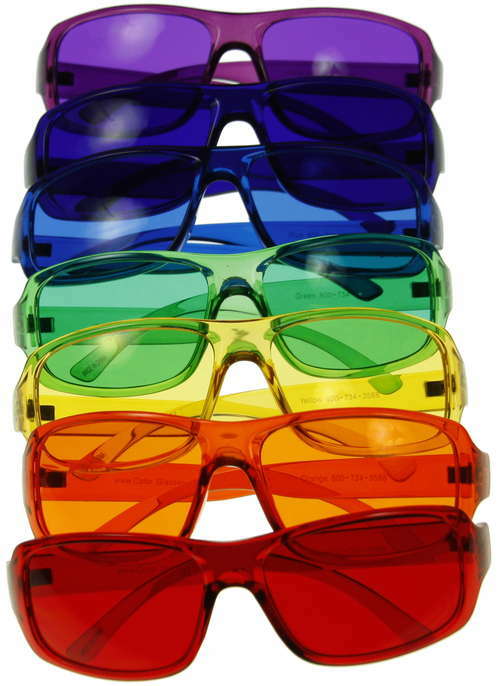 Click glasses to see a larger image. 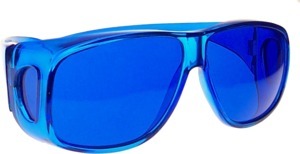 without glasses do not touch your face. 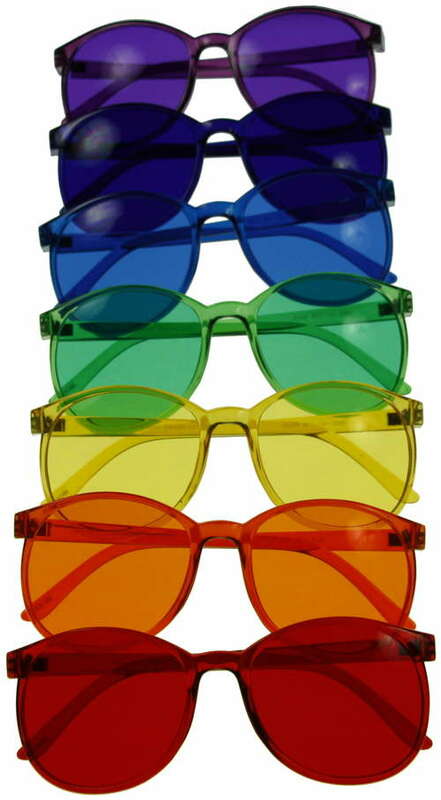 What Do Different Colored Sunglasses Lenses Mean? 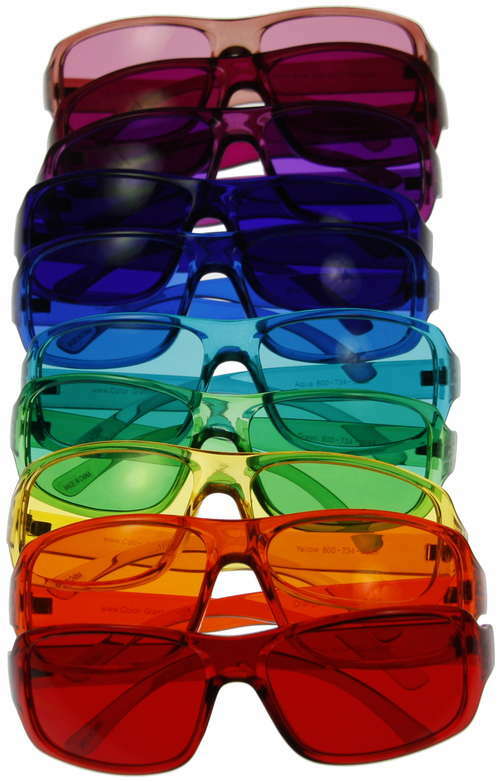 In the field of color therapy, color glasses are used to produce different effects, both emotional and physical. 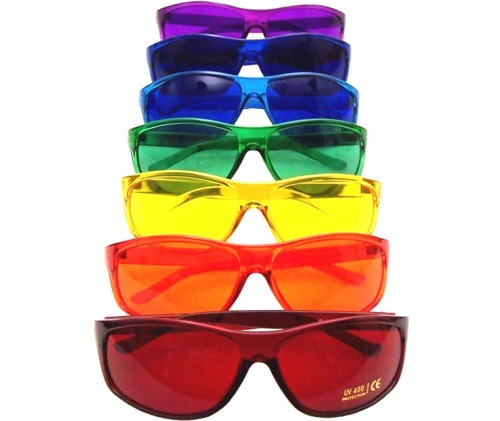 Read about color glasses therapy. 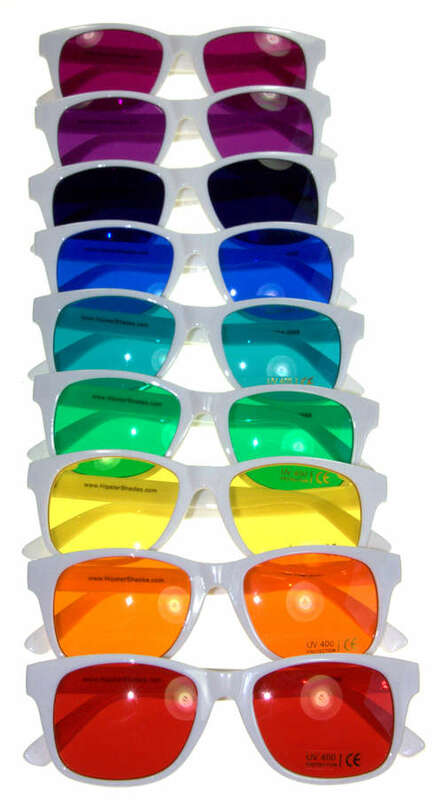 Contact us if you are interested in purchasing sunglasses wholesale. 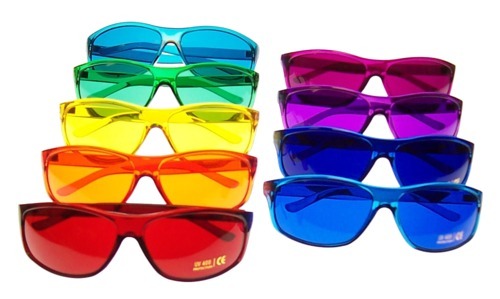 We guarantee everything we sell 100%. 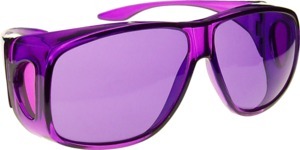 If you are not satisfied, return the item(s) for refund or exchange. 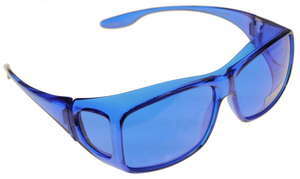 Get our email and shipping address. © 1996-2005 by ColoredSunglasses.com All Rights Reserved.